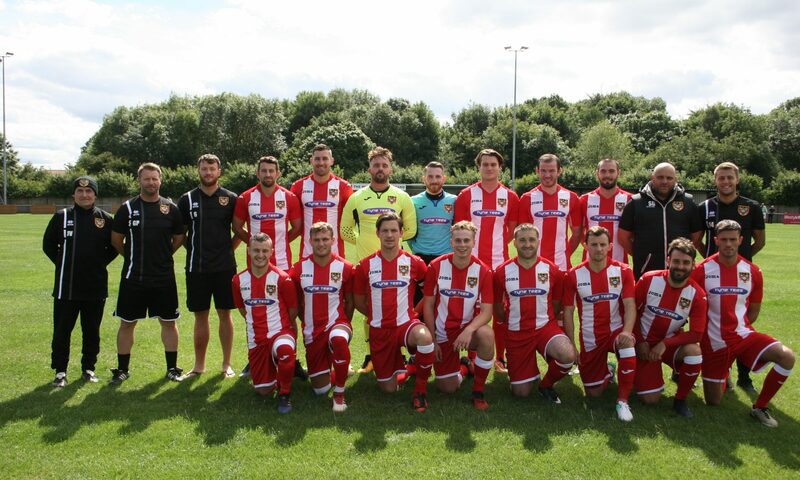 Ryhope CW overcame Crook Town away from home, beating the Second Division side 4-1 to progress from the Durham Challenge Cup preliminary round. Shaun Pickford scored twice to give Colliery Welfare an early two goal lead. Crook responded through Andrew Lonsdale but Ellis produced a brace of his own to make the score 4-1 before half-time. RCW had to deal with some adversity before the game started, goalkeeper Jonny Ball picking up an ankle injury in the warm-up. With no substitute ‘keeper on the bench, right-back Elliott Woods had to go in goal. The first good chance resulted in the first goal. Ben Riding knocked a good ball behind the defence in the 10th minute, Shaun Pickford latched onto it to produce a wonderful lob over Rowan Makepeace. Pickford doubled the lead just three minutes later with another great effort. The ball was played to him in a central area around 20 yards out, he shifted onto his right foot to release a powerful strike into the left corner. Ryhope limited Crook to very little time on the ball, and they struggled to get the ball in attacking areas. However, they halved Ryhope’s lead in the 20th minute, Andrew Lonsdale met a corner from the left, beating Woods to the ball to head home. Colliery Welfare showed no nerves despite their lead being reduced to one, continuing to dominate the play and create more chances. In the 32nd minute Pickford had a good chance for his hat-trick, latching onto an Ellis through ball to run one-on-one with Makepeace who was equal to his effort. RCW hit the woodwork twice in one 37th minute attack, Nicholson hitting the post first before the ball was cleared to Weirs who released a great effort from outside the box, hitting the bar. Ellis restored the two goal lead in the 39th minute with another great goal. He collected the ball around 30 yards out before dribbling through the Crook defence and producing a right-footed finish low into the left corner. Colliery Welfare were awarded a penalty in the 43rd minute, James Ellis stepped up and finished expertly into the left corner. The game slowed down in the second half, and there wasn’t a clear chance until Robbie Bird’s 70th minute shot was tipped over the bar by Makepeace. The win sees Ryhope into the first round of the Durham Challenge Cup. We now head into another away game on Saturday playing Wickham in the league, before a Ryhope Derby at home on Tuesday night.